The Lightning brand associated with Apple's new, smaller dock connector for iOS devices was obtained through a deal with motorcycle maker Harley-Davidson. Details of the trademark deal were made public in a filing with the European Union discovered by Patently Apple. The EU Certificate of Registration noted that the registered trademark for "Lightning" was originally owned by H-D Michigan, Inc., which is the intellectual property holding company for Harley-Davidson. The motorcycle maker originally owned the rights to the Lightning name across a wide range of product types: television sets, games, computer game programs, eye glasses, and eyeglass frames, in addition to motorcycle electrical parts, protective helmets and turn signals. Apple was given a "partial transfer" of the Lightning trademark, suggesting that Harley-Davidson likely retained the rights to use the name for motorcycle-related products. Harley's Lightning trademark remains protected until 2013, which necessitated Apple acquiring the rights to the name before launching its Lightning port and accompanying accessories. 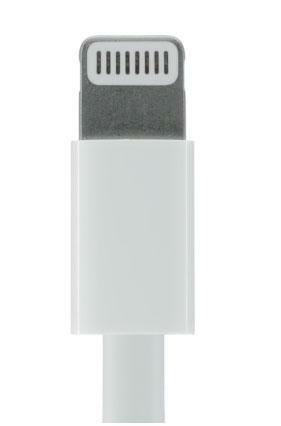 The Lightning port debuted in September on the redesigned iPhone 5, replacing the legacy 30-pin dock connector found on previous models. The redesigned port is 80 percent thinner than its predecessor, and is also orientation independent, making it easier to plug in. The Lightning port uses adaptive technology to dynamically assign its 8 pins. This allows the cable to be physically plugged into a device in two orientations.